A Dunkin' Donuts in Baltimore, Maryland, removed a sign discouraging employees from speaking foreign languages at work after backlash on Twitter. A sign posted at a Dunkin' Donuts shop in Baltimore offering customers free coffee and food if they report workers shouting in foreign languages to management has been removed. NBC affiliate WBAL-TV reports the general manager posted the sign in the store on West 41st Street. Gillian Morley, a news producer at the station, spotted the sign Monday morning and tweeted a photo of it. It read in part: "If you hear any of our staff SHOUTING in a language other than ENGLISH Please call ... immediately with the name of the employee to receive a coupon for FREE Coffee and a pastry." 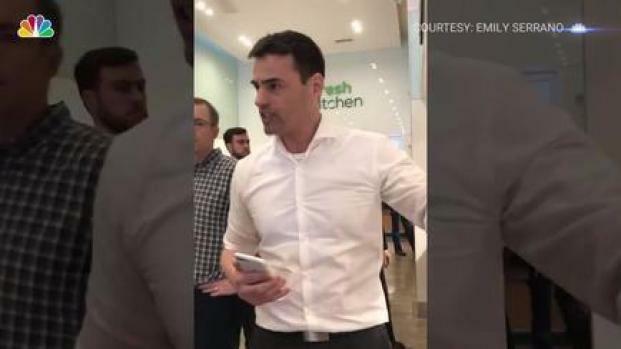 A man buying lunch at a Midtown cafe threatened to call immigration enforcement on its workers — all because he heard them speaking Spanish. The woman who took video of his tirade tells News 4 what happened. Ray Villeda reports. The photo created a stir on social media and the sign was removed later in the day. In a statement, Dunkin' Donuts corporate said a general manager of the shop posted the sign "based on her personal judgment." The franchise owner thought the sign was inappropriate and had it removed.